Hi! 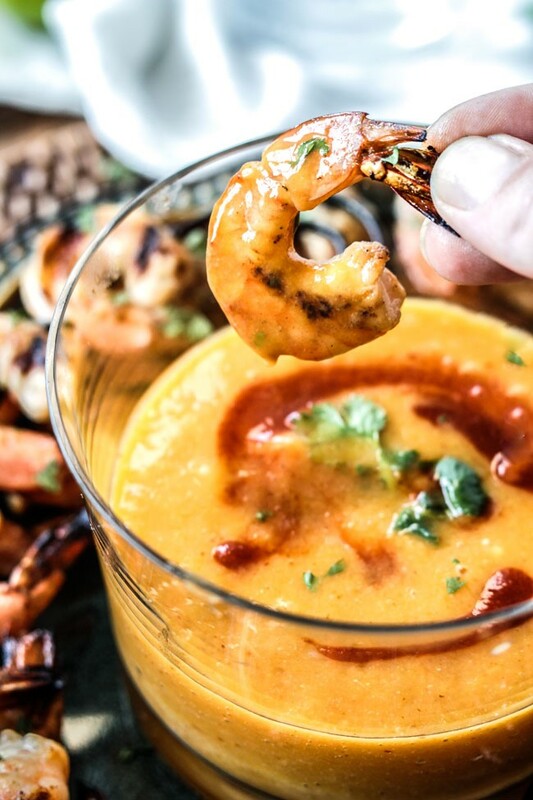 Its Jen stopping by from Carlsbad Cravings and I am so happy be sharing my new Coconut Honey Lime Shrimp with Sriracha Mango Dip with you! Hello delicious! 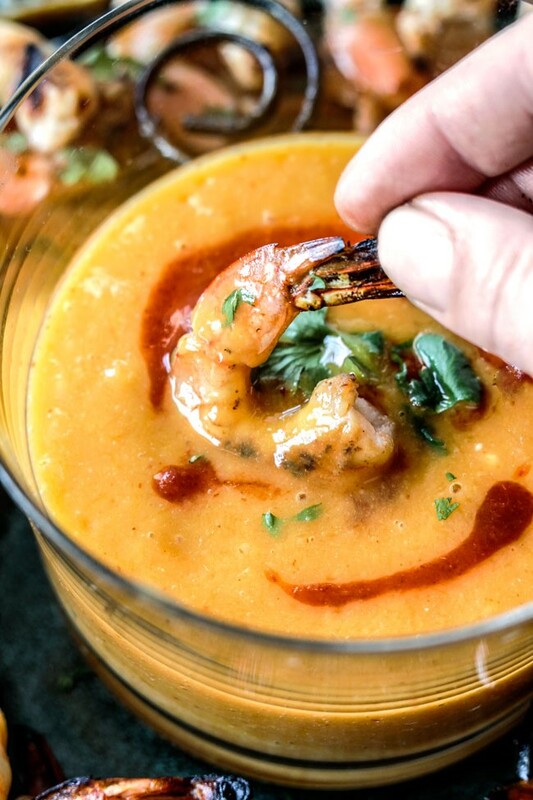 I love cooking or grilling shrimp because while it is so simple and quick to throw together with a marinade or a simple saute, the results always taste gourmet especially this Coconut Honey Lime Shrimp. This shrimp makes the perfect dinner or appetizer, is easy enough for everyday but impressive enough for company OR my personal favorite. Add all the Blender Marinade ingredients to your blender and process until smooth. Measure out ½ cup of Blender Marinade and add to a large freezer bag along with ¼ cup olive oil, ½ teaspoon salt and ¼ teaspoon pepper. Add shrimp to bag and massage to evenly coat. Marinate in the refrigerator for 1 -6 hours. When you’re ready to grill, drain and discard marinade. 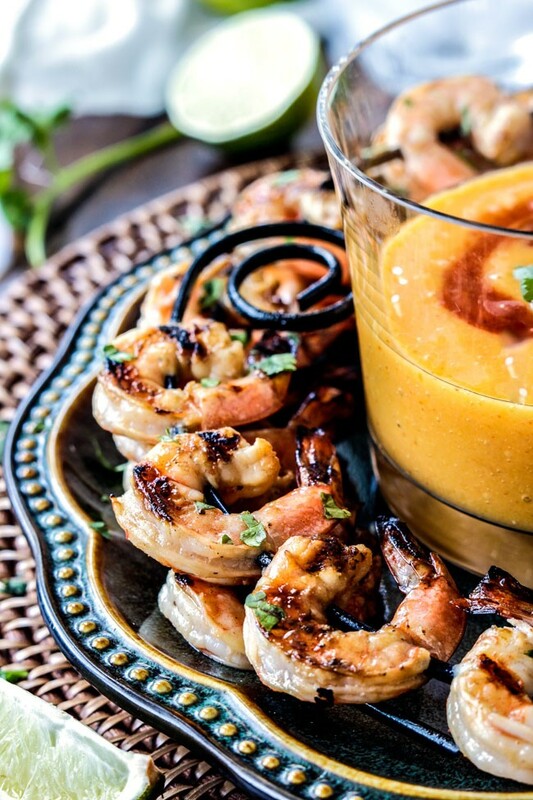 Thread shrimp onto skewers (if using wooden skewers, soak for at least 30 minutes in water) . *Refrigerate coconut milk for 24 hours then it is easy to skim the coconut fat that rises to the top of the can. It’s been a long long time since I’ve had fish fingers! Probably the last time was when I was a child :). Many kids love fish when it has a crisp coating and I guess these rectangle breaded fish pieces have made it onto every child’s plate. The freezers in the super markets are packed with different brands of processed frozen fish fingers with varying quality. If you want to make sure that the fish fingers your kids are eating are healthy, make them yourself! 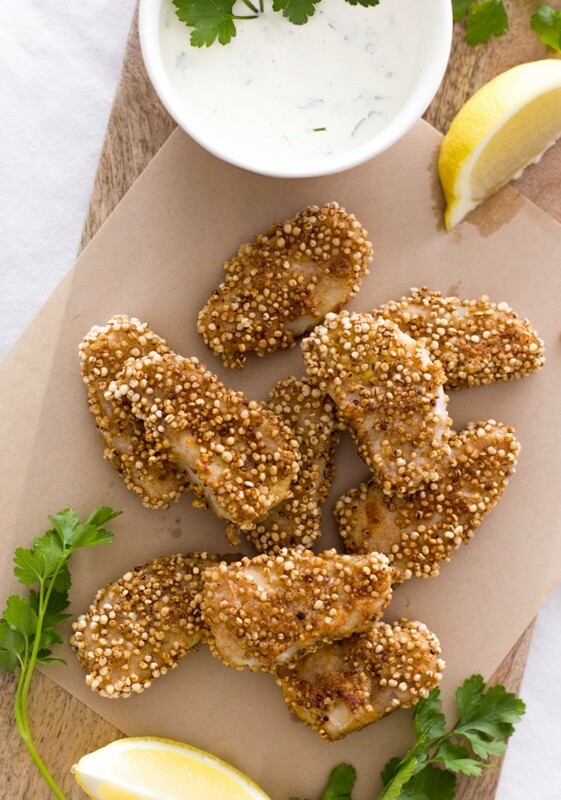 I tried it and I can tell you that these quinoa-crusted fish fingers are awesome! Maybe they aren’t the prettiest ones I’ve seen (they look quite homemade, I guess…), but I reassure you that they are super tasty! I know, it’s so easy to grab frozen fish fingers from the supermarket, so why bother do them yourself? Well, if you make them yourself, you can decide on what kind of fish, how much salt, what kind of coating as well as how much and what kind of fat you use. You know exactly what you’re using and you can make sure that there are no nasties hiding inside – just clean wholesome ingredients. 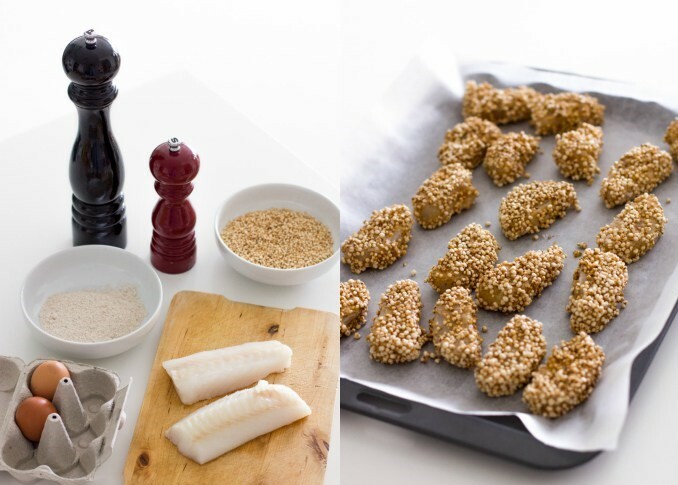 Making your own fish fingers literally takes only minutes. You just cut the fish into strips, season with salt and pepper, coat with flour, dip into beaten eggs, coat with quinoa pops (or flakes) and then fry in the pan. 6 steps and less than 30 minutes is all that it takes! It couldn’t be easier and there is no comparison in both nutrition and taste between a processed, frozen fish finger to a homemade one. 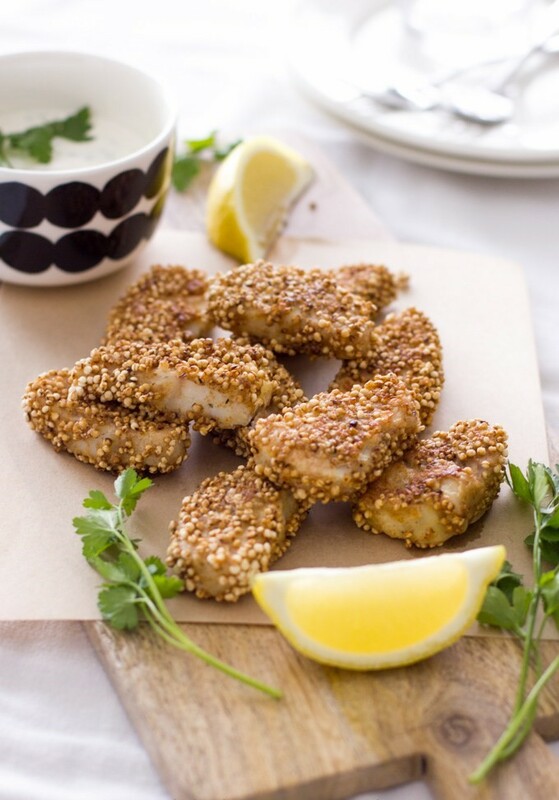 You can also do a batch of these quinoa-crusted fish fingers and freeze them, which makes it just as quick as a regular fish finger to prepare. Cut the fish into strips and season with salt and pepper. Coat the strips with spelt flour. Dip the strips into lightly beaten eggs and then coat with the quinoa pops or quinoa flakes. Heat some oil in a frying pan and cook the fish for 3-4 minutes or until golden and cooked through, turning half way through. Serve immediately. To make the yogurt tartare sauce, simply mix together all the sauce ingredients. Serve with the fish fingers. For our evening meal last night we made a rotisserie chicken purchased from our local meat store – free range, no antibiotics, and no hormones. 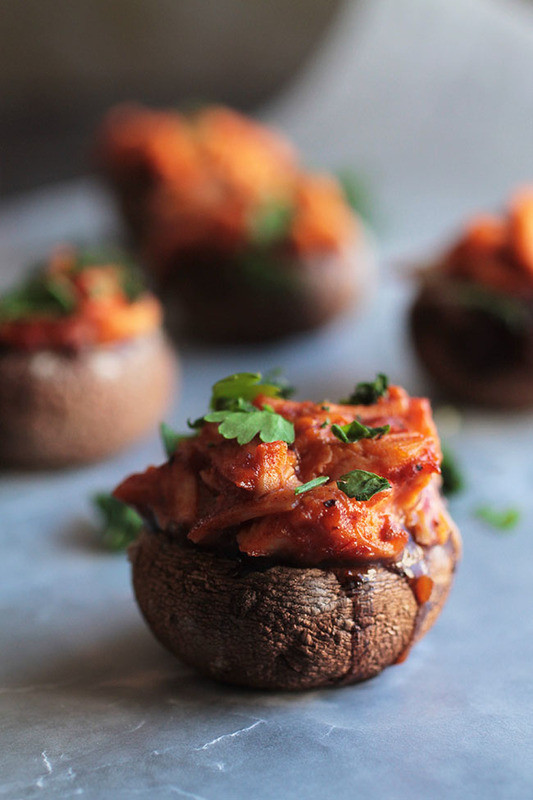 It tasted like the chickens we had growing up – delicious! As long time “empty-nesters,” we faced the usual next day leftover problem. Joanie’s solution was to make a classic chicken salad. To kick it up a notch she decided to prepare the salad in a “Caprese style.” We were off to search for tomatoes. 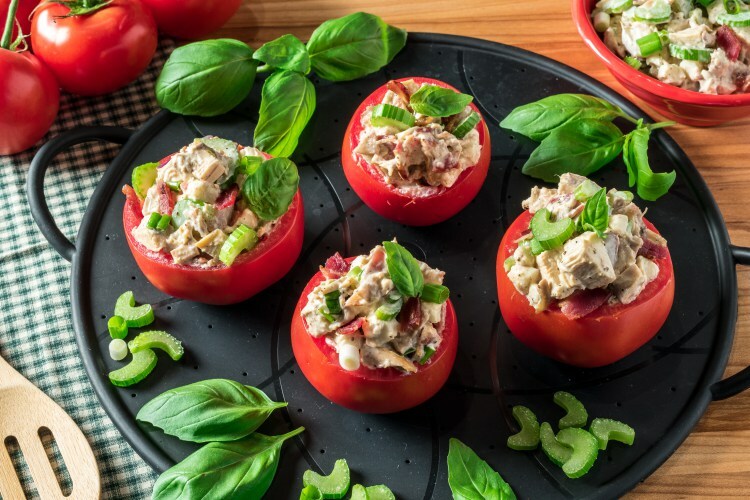 Chicken salad stuffed tomatoes are low carb and tasty! 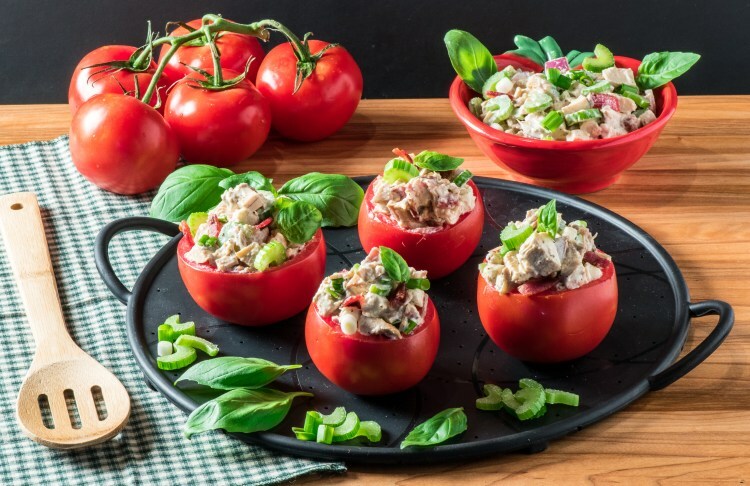 Serving the salad stuffed inside the tomato is what makes it a salad. We found home-grown large tomatoes grown from farms in the White Mountains. That is a treat for us in the hot summer heat of Arizona. The temperature is cooler in the mountains and the tomatoes are firm and delicious. 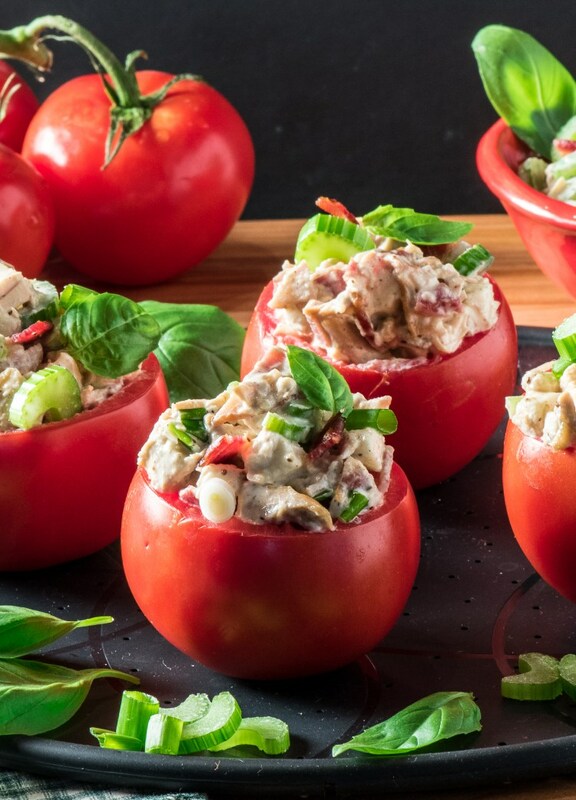 You can also use smaller tomatoes and serve the chicken salad as an appetizer. Filling a lettuce wrap or an endive spear with the chicken salad would also make a perfect salad. Our rotisserie chicken is the base for this salad, but the avocado mayonnaise is the “glue” that holds it all together. Regular quality mayonnaise would work, as well. But, avocado mayonnaise has similar properties found in olive oil. It is high in fat, loaded with potassium, and also helps with weight loss. Studies also suggest it provides cardiovascular benefits and even benefits for our eyes. One unique feature of Joanie’s recipe is that it is loaded with vegetables. Celery is the usual ingredient for chicken salad. 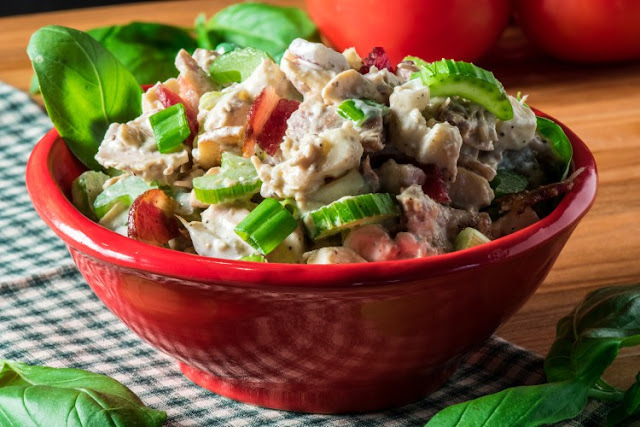 Her chicken salad recipe also adds red onion and green onion. She also added basil. After all, it is a Caprese-style recipe. It is also lighter on the mayonnaise than most chicken salad recipes. Joanie used sour cream to provide a different flavor than just mayonnaise. Adding to the creaminess is fresh mozzarella. Often called “buffalo mozzarella,” it is readily available and combined with the tomato provides the classic “Caprese-style.” All it needs is a garnish of fresh basil and you have perfection. Bacon – bacon – bacon! Look closely and you will see bacon crumbles in the salad. Bacon makes everything better! After removing the tomato tops, use a pairing knife to cut a 1/4 inch circle around the edge of each tomato. Then use a spoon or melon scooper to remove the pulp or flesh of the tomato. It will then form a hollow shell. Make sure to save the inside of the tomato to make another dish. Marinara sauce is always our “go-to” for over ripened tomatoes or leftover tomato pulp. It is a good idea to place the tomato cups upside down on a paper towel for a few minutes to drain any excess liquid from the inside. This will give you time to prepare the rest of the chicken salad. Taste your chicken salad when mixed for saltiness. Bacon does vary in terms of its saltiness so we suggest mixing and tasting before adding your salt. You do not want the chicken salad to have an overwhelming amount of salt. Joanie also likes to add celery salt in addition to the chopped celery. It really does add to the taste! Stuff the tomatoes – garnish with basil and enjoy! Slice the tops off of the tomatoes and scoop out the fleshy inside pulp. Place tomato cups upside-down on a paper towel to drain the liquid from the inside. Combine all remaining ingredients is a large bowl and mix well. Adjust the saltiness to taste based upon the salt content that is added by the bacon. Save some of the bacon crumbles and green onion for garnish. Fill the tomato cups with the salad mixture. Top with garnish of green onions and reserved bacon crumbles and basil leaves. 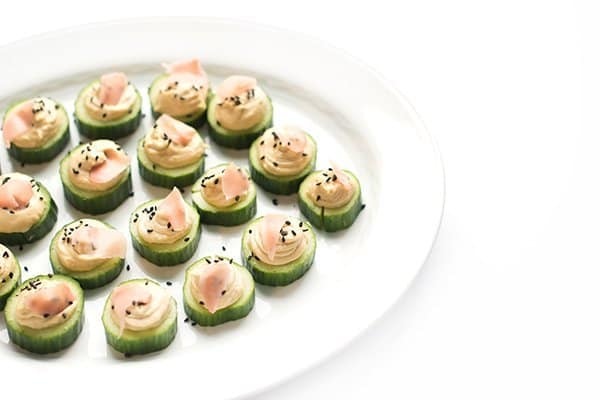 As innocent as they may look, bite-sized appetizers are often fried or loaded with over-processed and less-than-healthy ingredients. 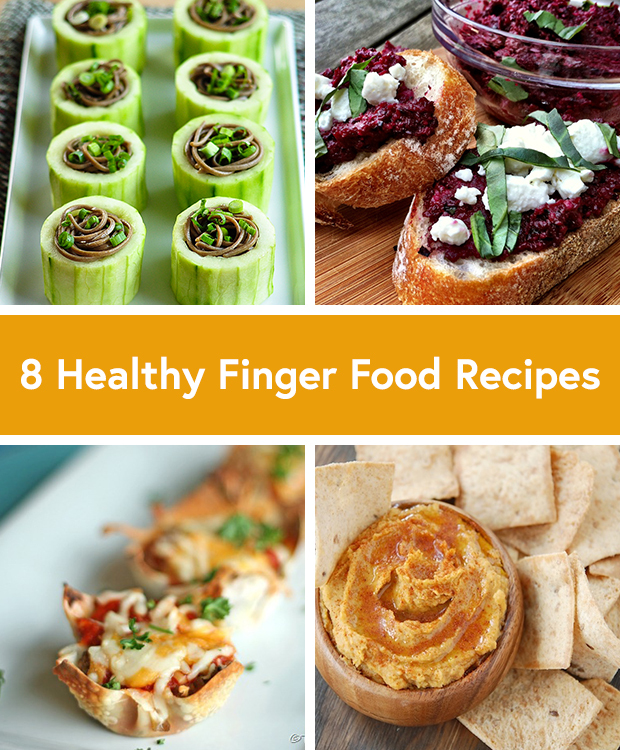 So pass up the puff pastry-covered goodies in favor of these finger food alternatives from healthy recipe bloggers around the web. You’ll be a dinner party hero in no time. Move over, guac. 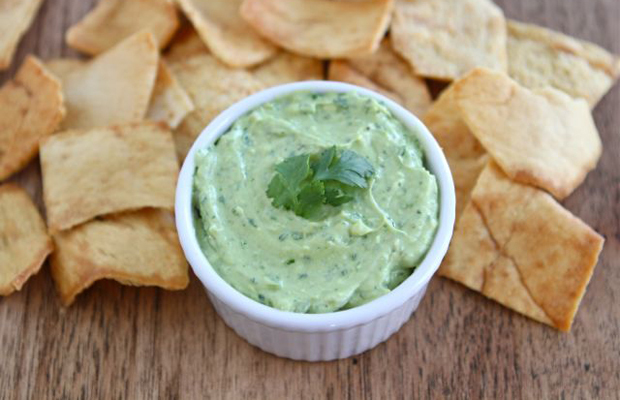 This creamy but guilt-free dip deserves to be front and center at your next fiesta. 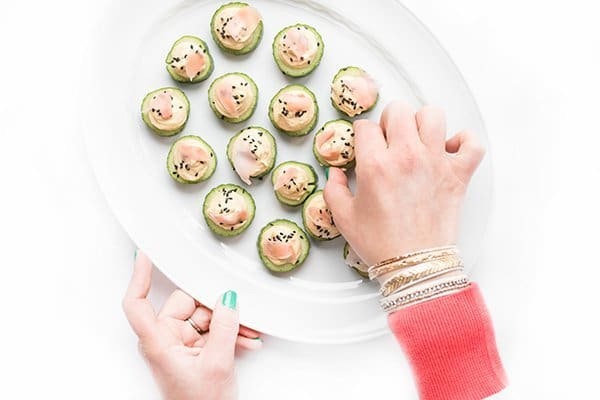 The rich texture comes from protein-packed Greek Yogurt and two ripe avocados, loaded with fiber and vitamin C. Serve with some whole-wheat pita chips or sliced raw veggies. 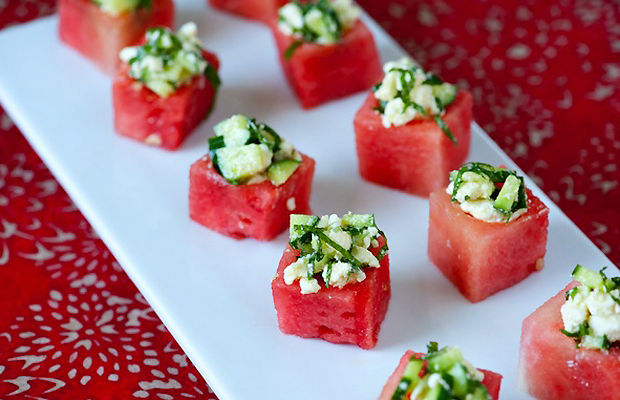 The sweet and salty combo of watermelon and feta will hit the spot on a hot summer day. Plus, with only five ingredients (watermelon, feta, cucumber, mint and EVOO), this recipe is super easy to make and requires no baking (hooray!). 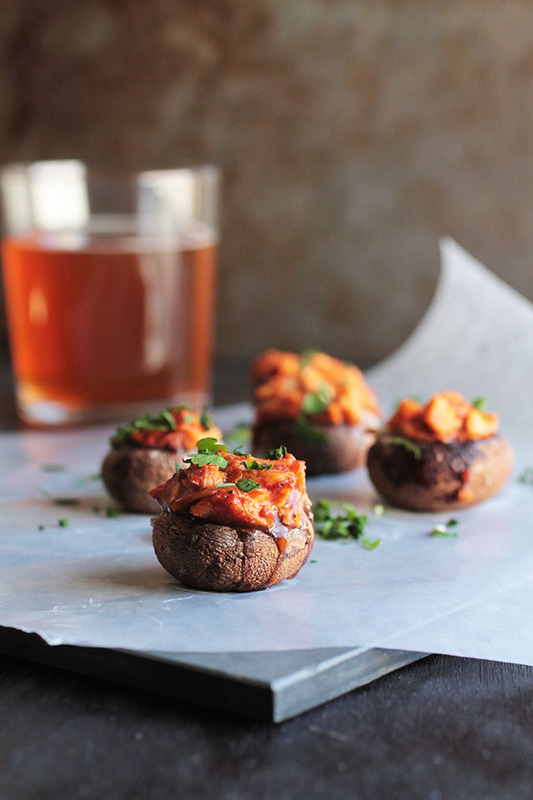 Consider serving them as a party-pleasing appetizer or side dish. 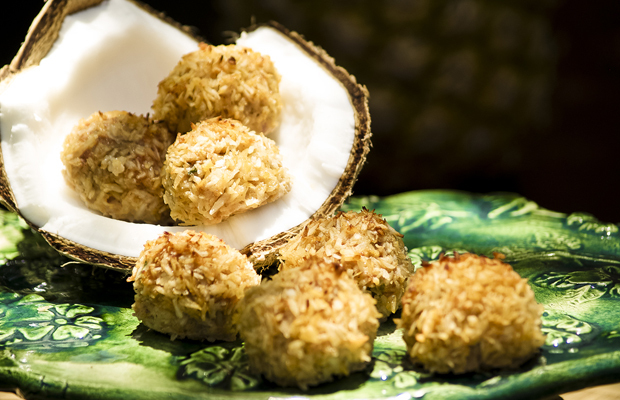 Go cuckoo for coconut with these tropical-tasting pork meatballs. Ground pork has fewer calories and fat than ground beef, but with about the same amount of protein to keep you satisfied. The Paleo-friendly fireballs get their sweetness from crushed pineapple and shredded coconut., while cayenne pepper, dried ginger and jalapeño spice things up. 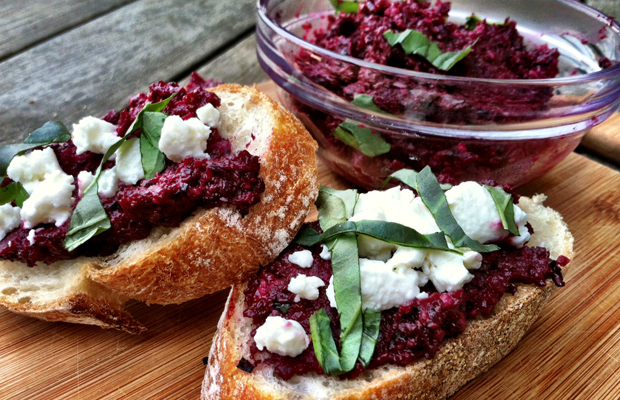 Liven up a sliced baguette or gluten-free crackers with this tasty beet pesto recipe, perfect for any summer soirée. Available all year long (but best from June through October), beets are chock-full of potassium, fiber and vitamin C. Top the pesto with a sprinkle of goat cheese and basil for a party-pleasing spread that’s ready in 20 minutes or less. Mamma mia! 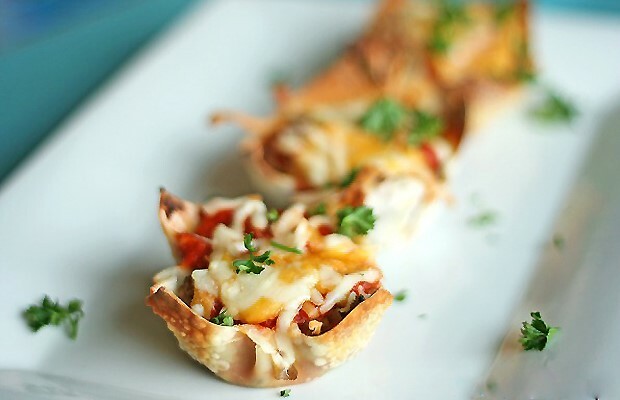 Making lasagna is usually a time-intensive process, but these bite-sized lasagna cups are a cinch to make. Using wonton wrappers instead of pasta (and don’t forget the spinach! 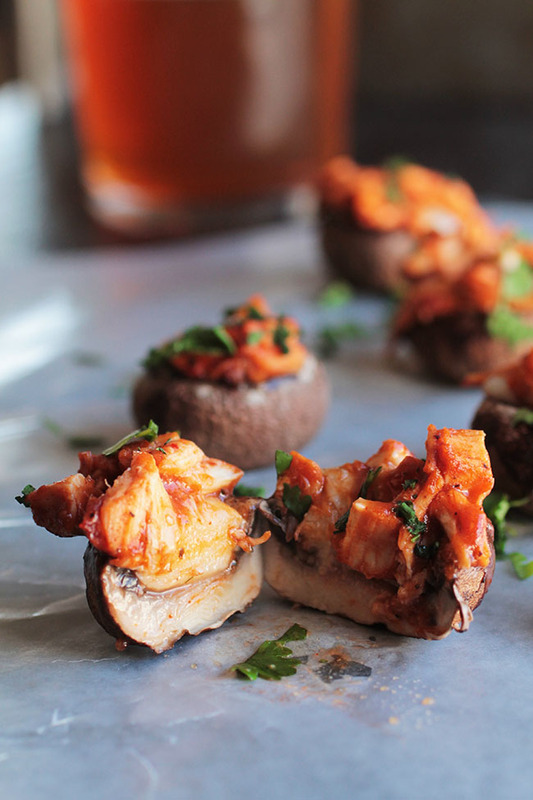 ), these hors d’oeuvres put a healthier twist on the Italian favorite. 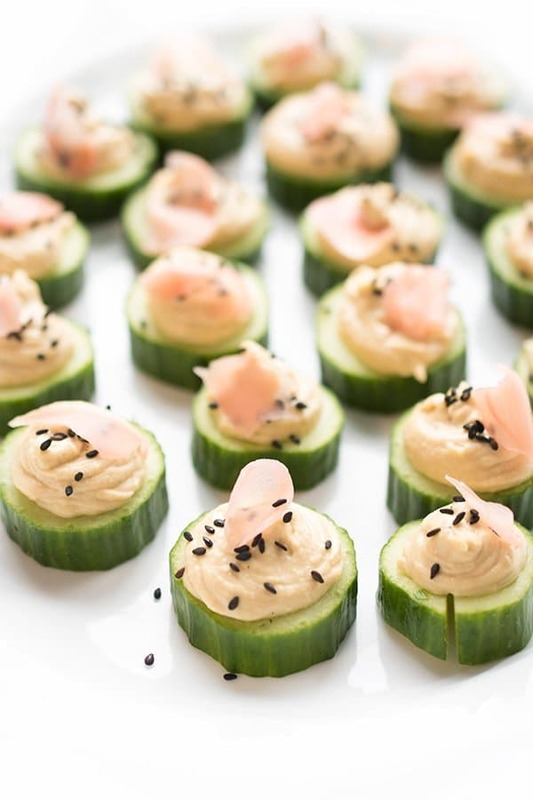 Talk about a healthy snack attack! This hummus pairs sweet potatoes, a great source of fiber and vitamin A, and chickpeas, which are high in protein and fiber. Serve it with whole-wheat pita chips and cross your fingers there are leftovers for sandwiches and wraps. 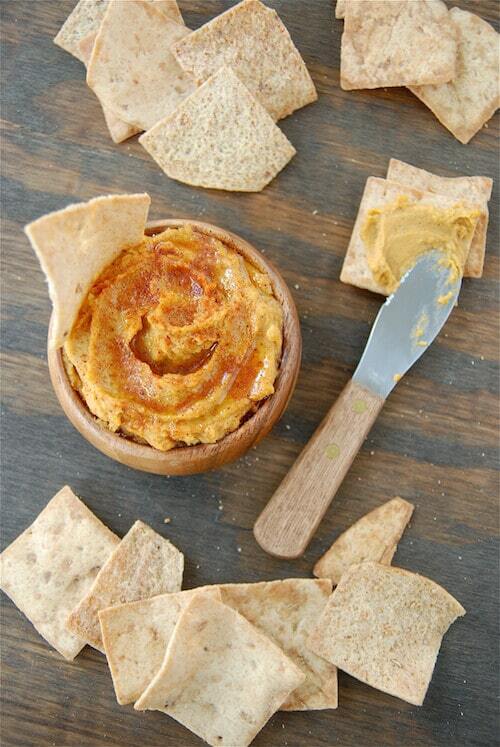 Hummus is quite possibly one of my favorite dips. Well besides eating straight up sour cream on pretty much anything…even a spoon. I’m not the only one who likes that right?! 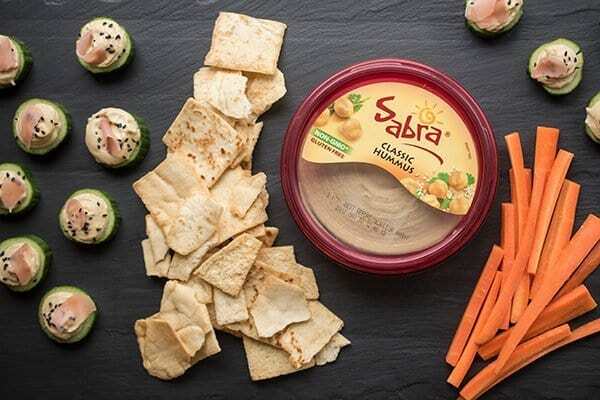 I still remember the first time I had hummus and I remember thinking, thank god this tastes nothing like chickpeas! It’s not that I don’t like chickpeas…it’s just they are so dry normally…and they don’t have much flavor. 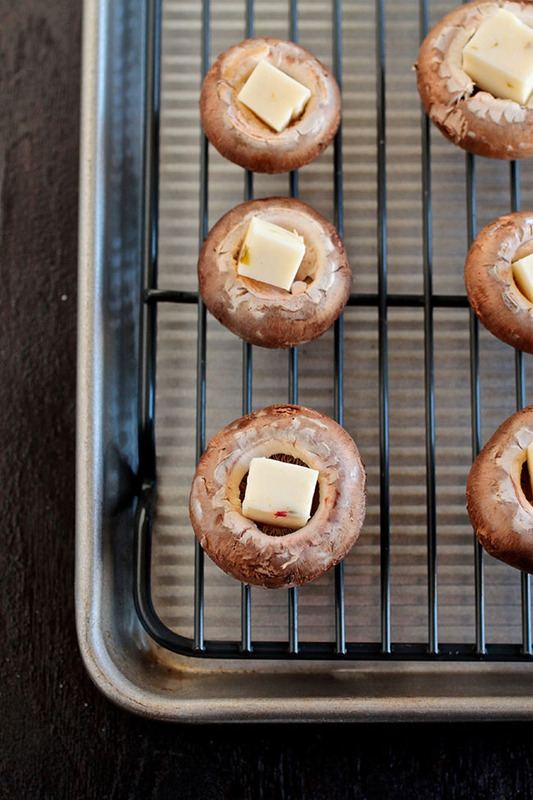 It’s kind of like eating weird little balls of flavorless dough. Ok, so maybe it is that I don’t like chickpeas. But if you add in enough garlic and olive oil, turns out chickpeas aren’t half bad! 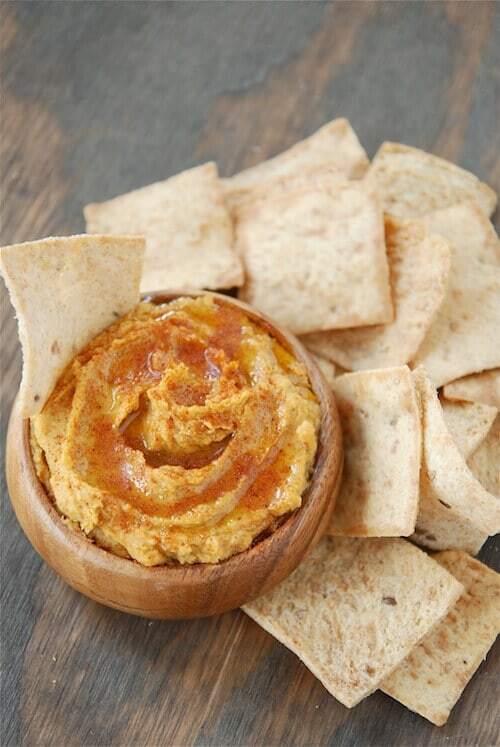 When I saw this recipe for Spicy Sweet Potato Hummus, I immediately tossed a couple of sweet potatoes in the oven. I knew I was going to love it considering my love of sweet potatoes…and I also knew that I could make a big batch and freeze the leftovers for later in the month. Plus, I really needed to use up those last few sweet potatoes I had bought when they were on sale after Christmas for .40 cents a pound! I have been making Sweet Potato Fries and my favorite Sweet Potato Coconut Curry Soup like they were both going out of style, but I was excited to try something new with my last two precious sweet potatoes. And this hummus did not disappoint! In fact, I think it’s one of my favorite hummus flavors yet! 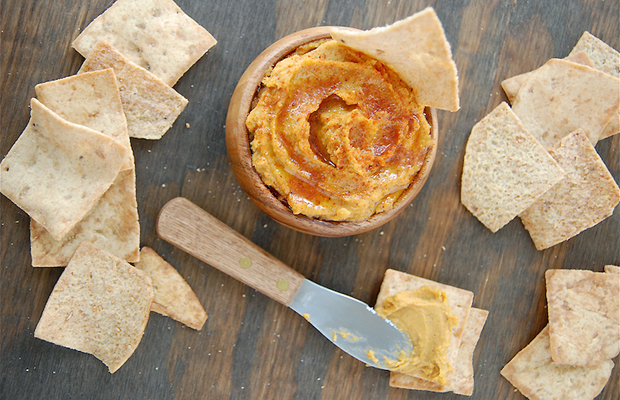 It’s sweet and spicy and goes perfectly with my favorite Stacy’s Baked Multigrain Pita Chips*. I am so glad I made a large batch to freeze and I am already dreaming up ways to use it! I think it would be awesome in a turkey wrap and can’t wait to try it out for lunch later this week. Preheat oven to 400 degrees. Wrap each sweet potato with foil. Bake for 45 minutes to an hour, or until tender. Peel sweet potatoes, set aside. In a large food processor (or blender), puree garlic cloves and chickpeas. Add tahini, lemon juice, olive oil, brown sugar, and spices. Puree until smooth. Then add sweet potatoes and puree until completely combined. Serve immediately with pita chips or store in an airtight container in the fridge until ready to serve. This makes a LARGE amount of hummus and is perfect to freeze! To freeze, place in a freezer safe ziplock bag and ensure there is no air in the baggie and freeze for up to 3 months. Let’s take a second to talk about lasagna. It’s the ultimate comfort food. The best, really.But it just takes too long to make right at home. Plus, serving it up can be such a mess. 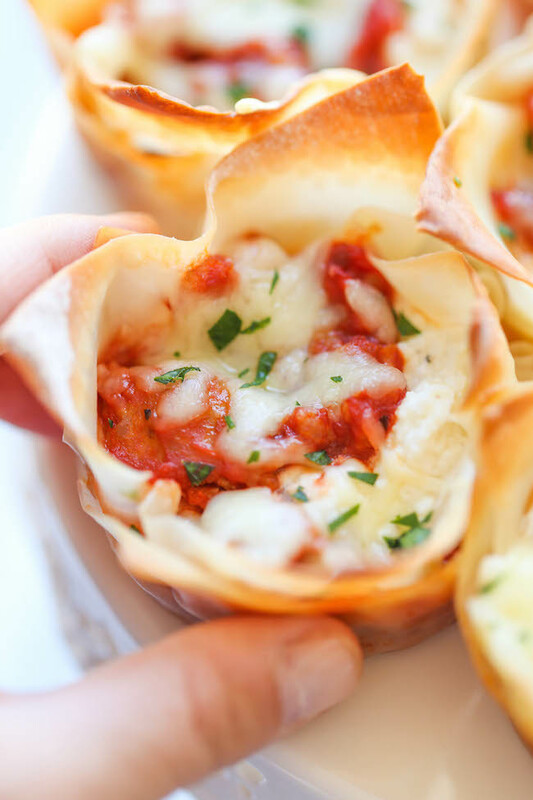 That’s why these mini lasagna cups are pure genius. It’s so easy to make and they’re conveniently made into single serving portions. 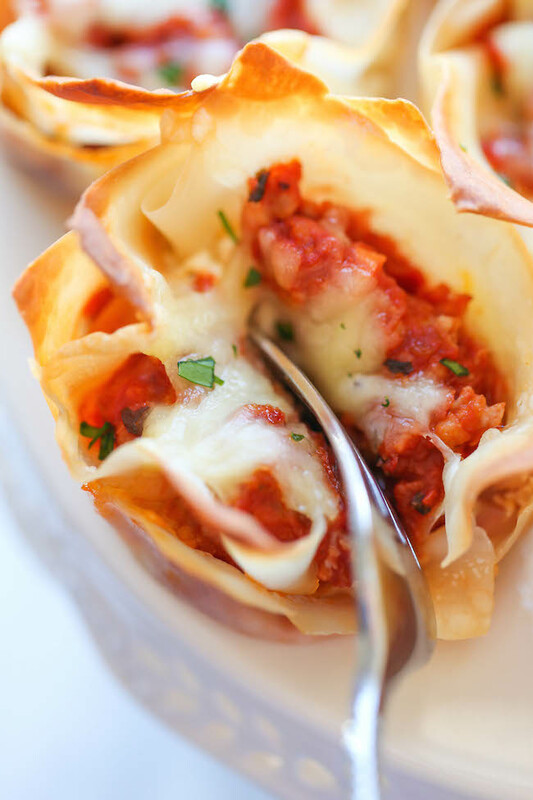 And with those crisp wonton wrappers, this may just be the best lasagna you will ever make. Plus, miniature food always tastes better, right? Preheat oven to 375 degrees F. Lightly oil a 12-cup standard muffin tin or coat with nonstick spray. Heat olive oil in a large stockpot or Dutch oven over medium heat. Add Italian sausage and cook until browned, about 3-5 minutes, making sure to crumble the sausage as it cooks; drain excess fat and stir in marinara sauce. Season ricotta cheese with salt and pepper, to taste; set aside. Fit wonton wrappers into each of the 12 muffin tins, pressing carefully to make sure there is an opening in the center. Fill each cup with 1 tablespoon ricotta cheese. Top with 1 tablespoon marinara mixture and 1 tablespoon mozzarella cheese; repeat with one more layer. Place into oven and bake for 10-12 minutes, or until the cheese has melted and the wonton wrappers are golden brown. As expected, our zucchini yield in our garden wasn’t as spectacular as it probably should have been this summer. I don’t know what it is, but we just don’t have a green thumb when it comes to growing zucchini. The first year we planted it, we got zero zucchini. How depressing. This year, our three seedling plants grew fabulously, flowered like it was there job (it was), and so far we’ve only gotten two zucchini (two more will be ready this week though). From three plants, I don’t consider that to be a success. But nonetheless, one of the zucchini we picked got chopped up and made into these baked zucchini fries. And to be able to eat what we grew and picked from our own yard made for such a satisfying dinner – all of the dread of a low yield just melts away. These fries are freaking awesome! A quick run through a basic flour-egg-panko combination then into the oven for 20 or so minutes is all that separates you from zucchini heaven. Because the fries aren’t actually fried, I feel like you are actually able to taste the zucchini and not just the grease (there is none of here anyway), which is certainly the goal with such fresh ingredients. They come out of the oven crispy on the outside and tender and not mushy on the inside…and not at all watery, which I was slightly worried about since zucchini is such a watery vegetable. While the zucchini fries were baking, I whipped up a batch of our favorite ranch dressing in the blender to dip them into – this should be a requirement when making these fries. I have a few other recipes planned for the rest of the zucchini that we pick but it’s certainly going to take a heckavalot of restraint not to make these fries again this summer! Preheat the oven to 425 degrees F. Line a 12×18-inch baking sheet with parchment paper. Whisk the eggs together until bubbly in a shallow pie dish or bowl. In another shallow pie dish or bowl (glass baking dishes work great too), stir the breadcrumbs, salt, pepper, garlic powder, and cayenne pepper together until well-blended. Set both dishes aside. 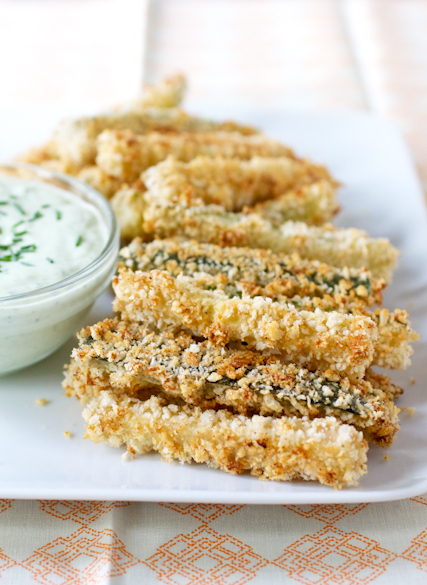 Place the flour in a large zipper bag (gallon-size works best) and toss in all of the zucchini sticks. Seal the bag well and shake up the zucchini until all of the sticks are coated with flour. Taking a few sticks at a time, roll them around in the beaten egg then coat them in the breadcrumbs, lightly patting the breadcrumbs onto the zucchini if needed. 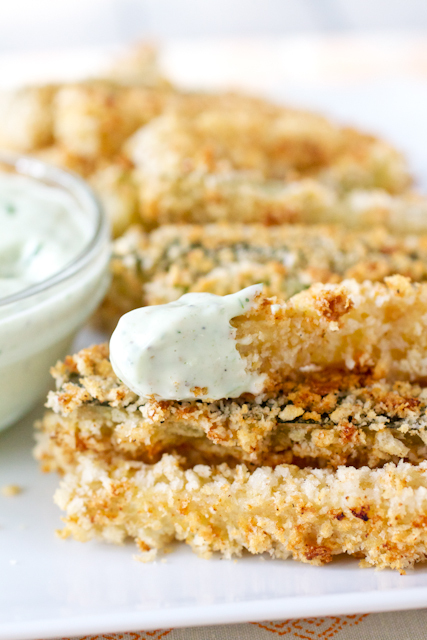 Try to not to handle the zucchini too much at this point or the breading with fall off. Carefully transfer the sticks to the baking sheet, spacing them about 1/2-inch apart. You’ll be able to fit the entire pound of zucchini on a 12×18-inch baking sheet, so push them close together if needed. 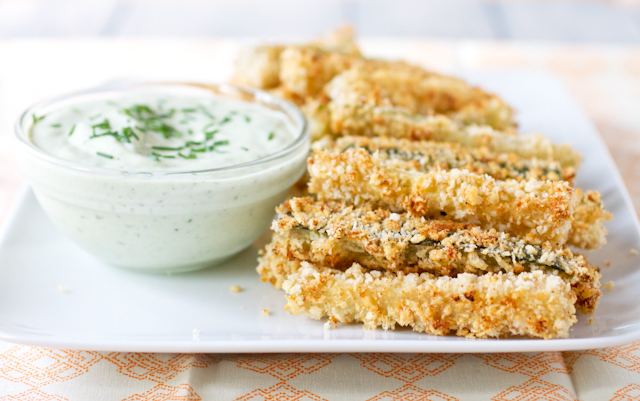 Repeat with remaining zucchini sticks. Bake for 18-22 minutes until golden brown and delicious-looking. 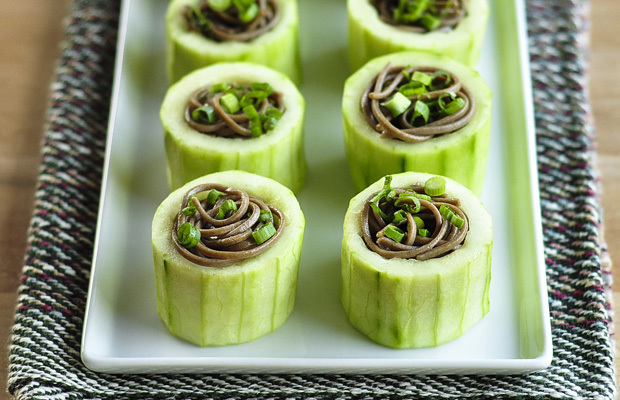 Serve with ranch dressing or marinara sauce. If you have leftovers, they reheat ok in the microwave, albeit soft and fork-necessary. The best way would be to reheat them in a 375 degree oven for 5-7 minutes until they are heated through.